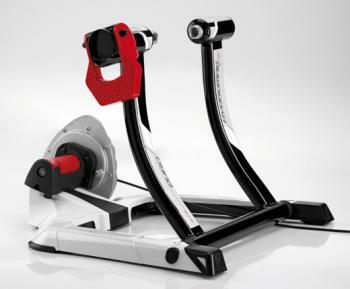 The Elite Qubo Hydromag trainer is all about options. 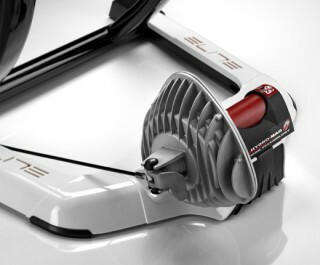 It combines the very smooth and road-realistic progressive resistance of a fluid cycle trainer, but offers the adjustable resistance levels of a magnetic trainer. 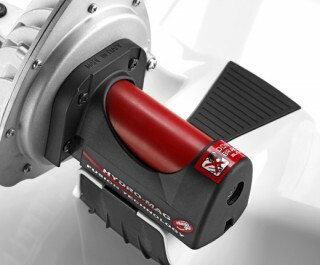 The combined magnetic and fluid resistance unit on the Hydromag is a rare combination, and the end result is a super powerful and extremely smooth ride. The Elite Qubo Hydromag adopts the Crono system that Elite has developed to provide a much more realistic feel because the actual weight of the rider influences the amount of pressure the back tyre has on the resistance roller. This means that a heavier rider will generate a different resistance output to a lighter rider, which is how it is out on the open road. Also, Elite have a special large Elastogel resistance roller, which reduces tyre wear by 20% and workout noise by 50% over conventional turbo trainer resistance rollers. The Hydromag trainer has a handlebar mounted resistance dial that allows you to select one of 5 different progressive resistance power curves, which means you can dictate what kind of workout you get. For example, you may just want a lower resistance warm-up session before you head out for real on your bike, or you may be having a gentle recovery session after a competition. In this case you would choose the resistance position 1 on the dial, which has a low progressive power curve. Alternatively, you may really want a heavy workout with the feel of steeper hills, and in such cases higher resistance levels should be selected. The maximum resistance at 40km/h is 900 Watts with the Elite Hydromag trainer, while the lowest resistance at 40km/h is around 350 Watts. The Hydromag is compatible with the Elite ‘My Training’ app, which outputs various performance metrics such as cadence and power. Note that extra sensors may be required to work with the app.